Yesterday I showed you how I made a super easy stenciled burlap wall art. 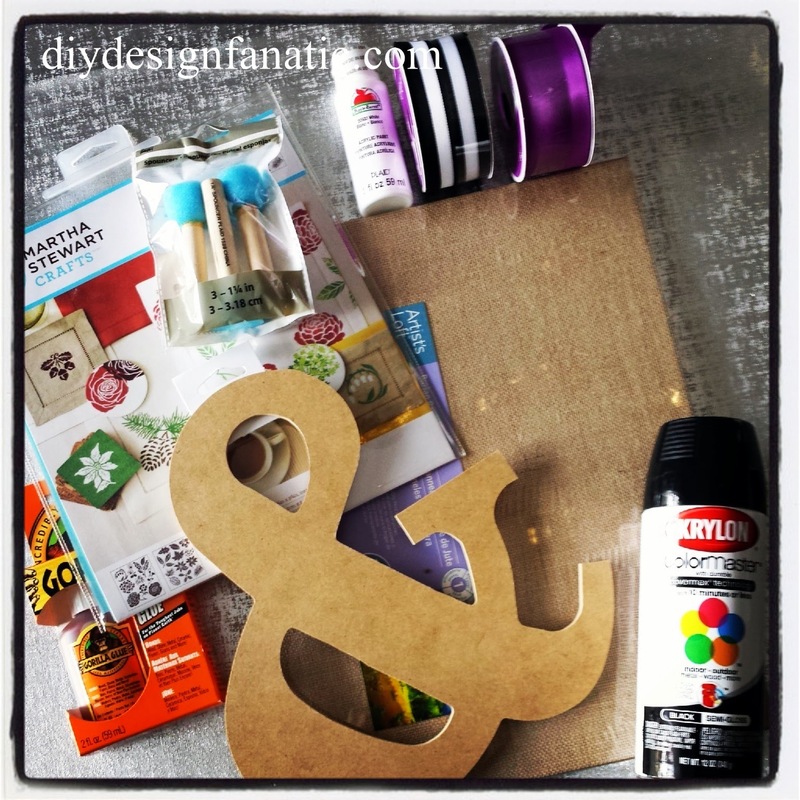 Today's burlap canvas is super easy, as well! Once again, here are the supplies I purchase for both projects. Spray paint the ampersand with the Krylon ColorMaster paint. The label says it dries in 10 minutes or less and it did. Spray several coats, letting it dry between coats. Sand the edges once the ampersand dried thoroughly. These little eye hooks were in my stash and I screwed them into the top corners. But, you could hot glued the smaller 1/4" hanging ribbon directly to the canvas, instead. The next step is to tie the bow on. I used 40" of the wide, striped ribbon, tied a knot in the center, then tied a bow. The canvas hangs from the 1/4" wide ribbon. Hot glue the 1/4" "hanging" ribbon to the striped ribbon at the knot. Also hot glue the striped ribbon to the 1/4" ribbon about 2/3rds down. 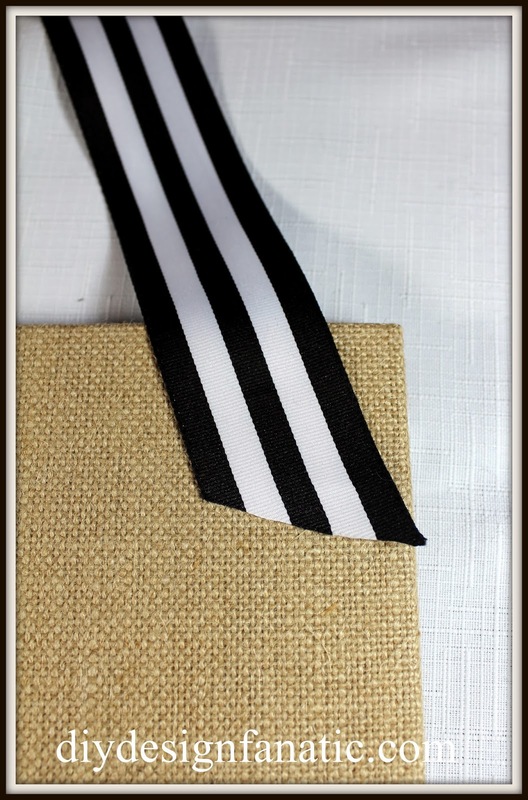 Finally, hot glue the ends of the striped ribbon to the burlap canvas. Once the ribbon is attached, "dry fit" the painted ampersand on the canvas. Place it exactly where you want it to go and place popsicle sticks around it so you know where to place it once you put hot glue on the back. Once the hot glue is on the back, place it on the canvas, remove the popsicle sticks and press it until the hot glue dries. I hope y'all will come out and see me at Michaels on Sunday from 1 to 4. If you can't visit me in Charlotte, be sure to visit the Michaels store near you. Super cute Pam!! And I love how you displayed them against the chalkboard. Gorgeous! what a lovely idea - easy done and a great look. I love it. I forgot to comment on yesterday's post. This is so cute. 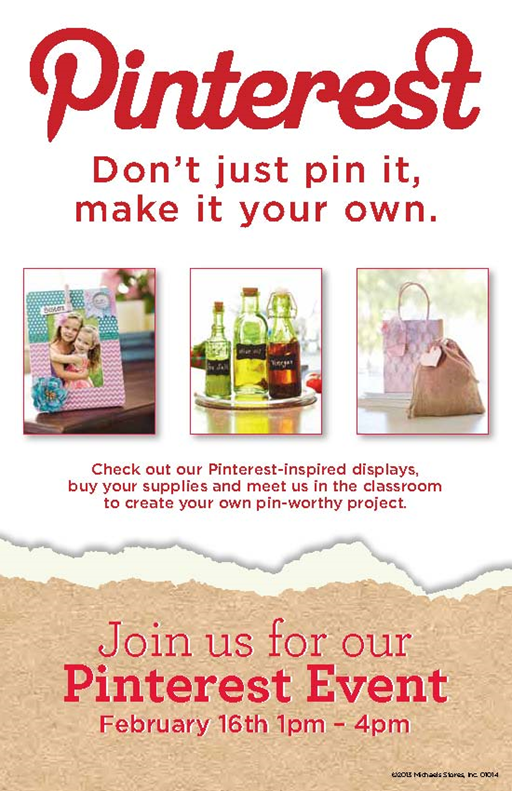 If I lived near you I'd stop in to see you at Michael's on Saturday! So cute and classy! Like all of your projects Pam! I love that you made the burlap canvases a "vignette" They are wonderful....Have fun at the Hometalk/Michaels party!!! Love me an ampersand! Enjoyed getting to know you + your blog from the Pinterest Party!